MSc Publishing students at Edinburgh Napier University were delighted to have the opportunity to get some inside information on publishing from two industry experts. 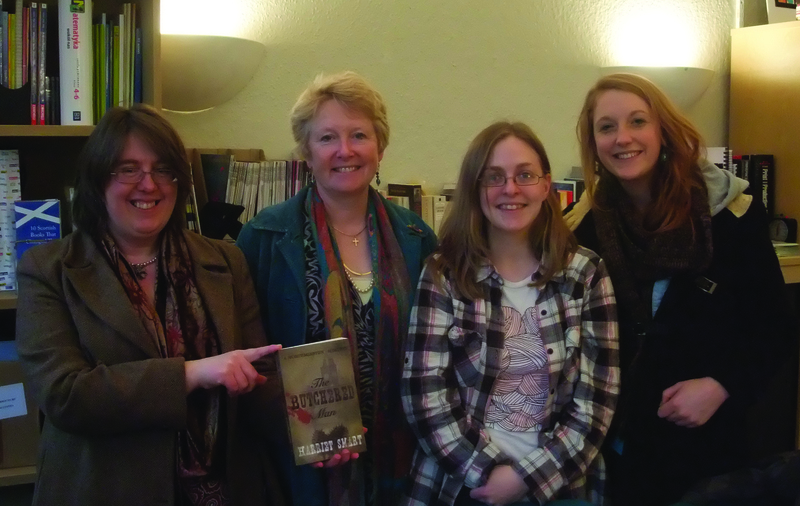 Alison Baverstock, an experienced publisher and author, and Harriet Smart, a historical novelist with experience of both traditional and self-publishing, gave a talk on self-publishing followed by questions from the audience. After their presentation Alison and Harriet indulged two MSc Publishing students, Rosie Howie and Ruth Harrison, by allowing them an exclusive interview. First of all, do you have any tips for getting a job in publishing? AB: I do think a Masters is a good idea as it gives an understanding of the business as a whole. If you go straight into a publishing company, that gives you an idea of only that small part of the business. It is a business and it’s really important to stress that. For the softer skills, the ability to network is very important. There’s always someone you know, who knows somebody. To make good links, to be polite, to follow up with emails and meetings, that sort of skill is very important. Also, not just to go for the obvious role. A lot of people who come to us want to be editors. There are many other roles, such as production and rights. The roles that are less well known get fewer applicants. How do you feel about social media? Are you Twitter or Facebook fans? HS: I’m obsessed with Twitter, I love it. It has helped me make great industry contacts and friends. I chat with my neighbours and yet I also chat with people who have got me interesting gigs and extraordinary things. I think blogging is great. I’ve experimented with Tumblr as well which I think is very interesting because it is so visual. Young people seem to have a very visual way of communicating with pictures and that is fascinating. AB: I’m worried how much time it takes. I divide my time of the day into what I’m going to do when. I would never use my best writing time for playing on Twitter. I try to do what I plan to do before I engage with social media. I regard it as playtime. I love Twitter, it’s great for reading recommendations but I wouldn’t want it to take over from my main point of effort which is writing. HS: I have to say I work in cafes without internet when I need to work so I don’t get distracted too much. When I’m deep in a project, it doesn’t really distract me. How do you feel about the digital advancement of publishing? Are books going to become extinct? HS: There’s an article in the American Publishers weekly, the same people are buying e-books and real books, the two complement each other. Books will have to become better books. The e-book is disposable reading for taking on holiday. Then books that you keep will become more objects of desire. There is so much good design going on. AB: It is odd how people talk about the digital future of publishing. It is not the digital future, it is the digital present. Authors email their file to their publisher. Digitisation is at the heart of production, design, layout, marketing. It is the fundamental heart of the industry. In terms of e-books taking over, there are some areas like professional publishing where we don’t see paper publishing any more. Lawyers and accountants using published resources, it’s all on screen. User generated content allows lawyers to add instances from your organisation to the database. It personalises what you’ve created and it makes it less likely you will cancel your subscription. In some parts of publishing it’s absolutely what’s happening. In terms of the printed book there is a whole new market of publishing which is the luxury book. For example cook books – I’ve got them but I don’t cook from them. There are also art publishers who aren’t selling through book shops, they’re selling through art galleries. The beautiful thing is that there is no competition. If you’re in a gallery selling, it’s only your book there. The luxury book is an object that can be given as a gift. AB: I was in the National Portrait Gallery in London a few weeks ago. They’ve got an exhibition coming up of Linda McCartney photography which has a book with it. Paul McCartney has signed a hundred copies, each book selling for a thousand pounds. It’s moved beyond being a book, it’s an investment. HS: The second-hand value of something is interesting. Books can be passed to friends and sold on. AB: At literary festivals there is a limit on signings of 6 copies maximum as people are selling them on eBay. Are book festivals becoming more or less important in the digital age? AB: They’re becoming much more important because it’s the only chance you have as a publisher to sell a book for the full price. They also add to the specialness of the author/publisher interaction. Mind you, I have to say that having taken part in the States and we really need to sharpen up. I’ve taken part in book events in UK bookshops where the event is allowed to run on, they don’t allow time for people to buy the books. I remember in America in an independent book shop somebody – the manager – stepping to the front and saying ‘you’ve heard the talk and now is your chance to have your own special moment, your own souvenir of this unique interaction’ and it was so powerful I don’t think anybody dared to not buy the book! From a writing point of view, how do you feel about electronic enhancement to your books? HS: I think that’s such a hard question, if you think of 19th century novels, for example illustrated by Millais. I wouldn’t mind some Millais engravings tucked into my book. I think a creative collaboration with an artist could be quite a good thing. I think if I was writing an eBook about writer’s houses or a group of artists in late 19th century France, I would love to have music and pictures, and little bits of video, etc, to go along with the text and it would be a little like an interesting documentary but then I suppose there is then a question of what are you authoring, is it really a book? But as for the novel, I couldn’t say! AB: I think it’s an interesting development, for me it’s a natural development from illustrated fiction. I think the difficulty is that there is a significant difference between a film and a book. The film gives you the images, the vocabulary, the ethos, whereas a book is what’s in your head. I think it compares to how Lego used to come in packs of mixed bricks and you built something with your imagination. Now it comes in a prescribed box which you make up once and then never do again. I think it would be a shame if a book became a series of choices that were made for you. This is the music, this is what the heroine looks like, this is what the hero looks like. I think it would be a shame if it became too prescriptive. What about for your non-fiction books? AB: For non-fiction it could work beautifully and we use that in our teaching. But for fiction I think it is your own journey. HS: I think it could just be a question of form. Look at Tumblr, it’s just gorgeous. People are putting together all of these pictures and telling stories. I mean they’re evocative pictures, which imply narratives and I just find it astonishing the way people are thinking more and more in pictures. Well, we both come from an art history background so it’s interesting that we’re now both wordy people and the power of the image is such that words have to try very hard to compete. But maybe we’ll have a new form in the future. I mean the novel only emerged 300 years ago. AB: Yes, the novel hasn’t been around forever. Do you think British publishers should look more to the international market for opportunities? AB: In Britain we’re in a very privileged position because we have the international language. But we’re getting more and more isolated in that sense because we don’t speak another language and certainly the amount of fiction that we take in translation is minuscule compared to other countries. I think the danger is that we start underestimating people. People are travelling more, they’re taking gap years and becoming more interested in other cultures. The challenge to us should be to achieve good literature regardless of where it comes from rather than what we have in English already. HS: I can’t imagine a publisher buying the rights to Japanese phone novels, or doing similar, but then look at the rage around Scandinavian literature. It’s good work for translators! Our time is almost up, but there’s one last question everyone’s dying to know the answer to… What are Richard and Judy like in real life? AB: I thought they were charming, and they were really intelligent. People are so flippant about them but they are really interesting people. The day I was there, Judy had to leave early to go to the charity launch for the trust set up for Gloria Hunniford’s daughter, Karen Keating. But I had a long chat with Richard after the show and I really liked him. They are vastly more intelligent than people give them credit for and they really read the books, they’re not bluffing! I managed to get a signed photograph for my mother. I’ve provided her with four grandchildren but that was her proudest moment. When she found out I was going to be on the telly, she actually bought a new recorder so she could double the recording in case one system failed. Mind you, in terms of getting any work done that week it was a killer because I was terribly excited and nervous, and then I did it, and I was in a euphoric state and winding down so I lost a week! HS: Which is a lot in her work schedule – she’s the most productive person I know!